HEAR O ISRAEL! THE LORD IS OUR GOD, THE LORD ALONE. Our readings this Sunday ask the important question - What is most important in your life? Jesus gives us the answer in today's Gospel. In our first reading (Deuteronomy 6:2-6) we hear Moses teaching the Israelites the central theme of the Mosaic Law; what ultimately became known as the Shema Prayer. Shema, in Hebrew, is the first word of the prayer, "Listen" or "Hear O Israel." This prayer is still prayed today by devout Jews every morning and every night. Moses spoke to the people, saying: "Fear the LORD, your God, and keep, throughout the days of your lives, all his statutes and commandments which I enjoin on you, and thus have long life. Hear then, Israel, and be careful to observe them, that you may grow and prosper the more, in keeping with the promise of the LORD, the God of your fathers, to give you a land flowing with milk and honey. "Hear, O Israel! The LORD is our God, the LORD alone! Therefore, you shall love the LORD, your God, with all your heart, and with all your soul, and with all your strength. Take to heart these words which I enjoin on you today." In our Gospel reading (Mark 12:28-34), Jesus is questioned by an apparently friendly scribe, "What is the first of all commandments?" Jesus answered by reciting the Shema prayer we hear in our first reading. But then, he took it a step further, "Love your neighbor as yourself." One of the scribes came to Jesus and asked him, "Which is the first of all the commandments?" Jesus replied, "The first is this: Hear, O Israel! The Lord our God is Lord alone! You shall love the Lord your God with all your heart, with all your soul, with all your mind, and with all your strength. The second is this: You shall love your neighbor as yourself. 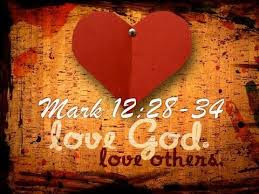 There is no other commandment greater than these." The scribe said to him, "Well said, teacher. You are right in saying, 'He is One and there is no other than he.' And 'to love him with all your heart, with all your understanding, with all your strength, and to love your neighbor as yourself' is worth more than all burnt offerings and sacrifices." And when Jesus saw that he answered with understanding, he said to him, "You are not far from the kingdom of God." And no one dared to ask him any more questions. In our Epistle reading (Hebrews 7:23-28), we hear of the Jewish high priests, who would offer sacrifice once each year and would ultimately die and be replaced by another. He would offer atonement for his own sins as well as those of the people. Then we hear of Jesus, our eternal high priest, who offered himself as sacrifice once, for all. Brothers and sisters: The levitical priests were many because they were prevented by death from remaining in office, but Jesus, because he remains forever, has a priesthood that does not pass away. Therefore, he is always able to save those who approach God through him, since he lives forever to make intercession for them. It was fitting that we should have such a high priest: holy, innocent, undefiled, separated from sinners, higher than the heavens. He has no need, as did the high priests, to offer sacrifice day after day, first for his own sins and then for those of the people; he did that once for all when he offered himself. For the law appoints men subject to weakness to be high priests, but the word of the oath, which was taken after the law, appoints a son, who has been made perfect forever. What Jesus puts to us succinctly in today's Gospel is the thought that all sin is in one form or another an offense against God, another person, or our own person. That is why all commandments can be summarized in these two great commandments. It might make for a good nightly examen - "How have I sinned against the sanctity of God, how have I sinned against the sanctity of others, how have I sinned against the sanctity of myself?"